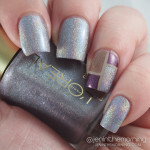 Over the past couple of weeks, I had been seeing talk about Revlon – Holographic Pearls, a lovely scattered holo topcoat. When I found myself at Walgreens the other night, I looked for and found it along with a few other new top coat effects. I spotted Matte Pearl Glaze and decided to go ahead and pick it up since Walgreens was running a B1G1 Half off. When I got home and swatched it on a stick, I decided I wanted it on my nails right away! I started off this mani with one coat of Color Club – Nail-Robi (which I mentioned in this review post) and topped it with a coat of Seche Vite. 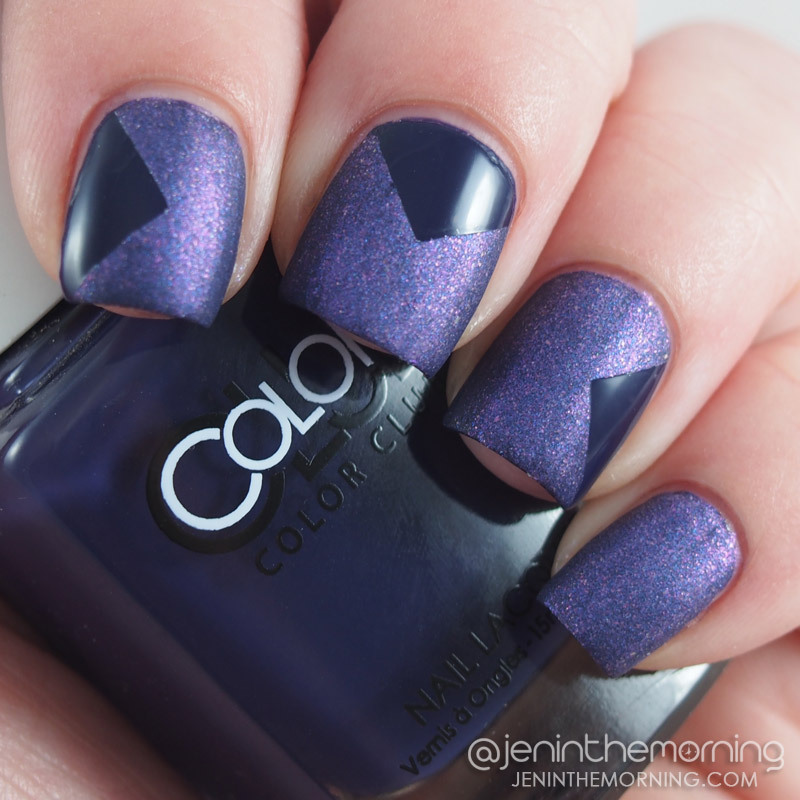 Once the top coat was dried, I used angled vinyls from Glam My Mani to create cut-out shapes on my nails. After placement, I used one quick coat of Revlon – Matte Pearl Glaze and painted the rest of each nail, quickly removing the vinyls as I went along. My picture does not do this polish justice! 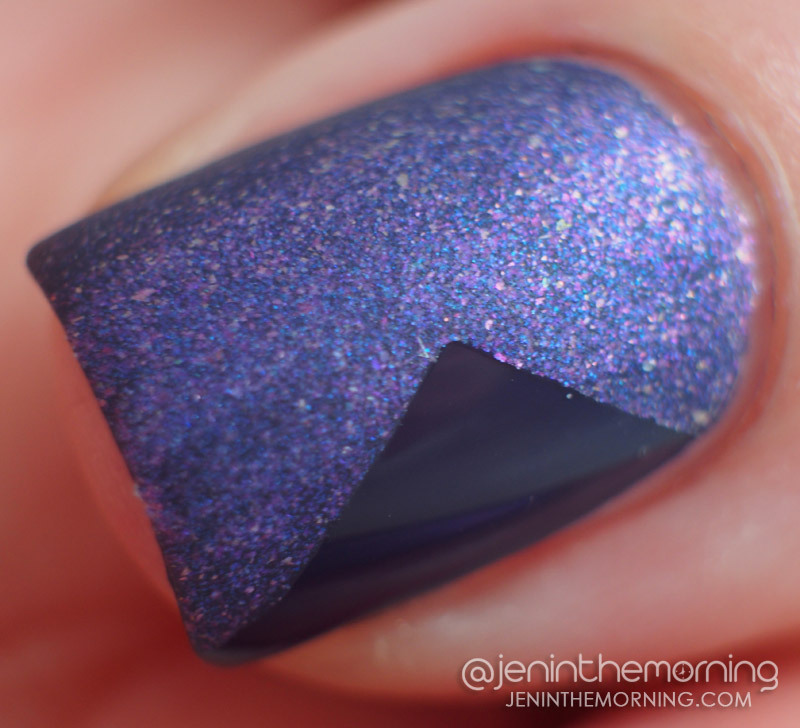 Matte Pearl Glaze is filled with blue and pink micro shimmer and is amazingly transformative! I cannot wait to try this over some lighter colors. Along with the Holographic Pearls topcoat, Revlon is another drug store brand that seems to be at least paying attention to nail polish lovers desire for new and unique!